Marty, a young boy who experiences bullying at school, discovers that his brother is a serial killer. 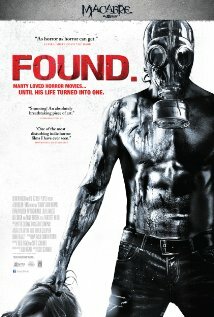 Found is a really interesting movie. Rather than using Marty’s discovery of his brother Steve’s ever-changing head collection as a shocking twist at the finale of the movie, it instead uses the early uncovering of this fact as the linchpin upon which the rest of the movie revolves. Because of this, in a lot of ways it’s actually more of a coming of age story than anything else – which is exactly what makes it stand out. The story revolves around the way that Marty processes his discovery, and uses it as a way of further developing his own identity, and his relationship to the world around him. Sound like a strange way of approaching a movie about a head collecting serial killer? Well, that’s what makes it interesting! Depending on what you think of Gavin Brown’s acting as the lead of Found, the focus on his character’s development might also be what turns you off the movie. Me? I thought he did a decent job of portraying a kid whose experience of bullying had left him isolated and disaffected – and whose love of horror movies offered him a point of connection with an older brother who he was struggling to find some common ground with. However, I can also see how someone might think that he underplays the character to the point of monotony. It’s not really clear-cut, either way. There’s one thing I am certain about, though: the last scene of the movie? By far, it’s the weakest. I won’t go as far as to say that it ruined the movie for me, but it was definitely jarring enough in comparison to the tone that the rest of the movie had followed, that it felt completely out of place. It really felt like something that had been done for the sake of shock value, rather than for the sake of staying true to what had come before; and that was a little disappointing. Still! If there’s one thing that writing for this blog has reminded me of, time after time, nothing is perfect. So, with the caveat that I don’t think the ending was handled correctly, I’m still comfortable suggesting that Found is worth a watch.